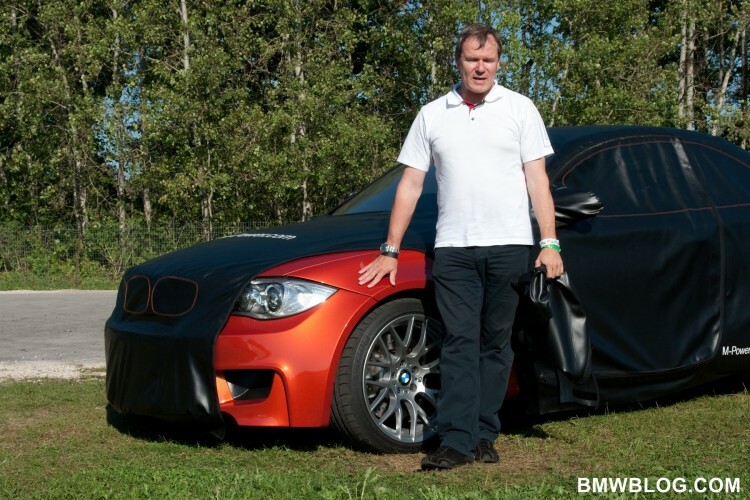 BMWBLOG had the recent pleasure of sitting down with Dr Kay Segler, President of BMW M cars. Dr Segler’s enthusiasm and passion for sports cars was obvious, there was an excitement in his voice we’ve seldom heard from car executives. Dr. Segler was very personable and displayed a great sense of humor, we thoroughly enjoyed our time with the man behind M cars – in fact we ran out of time in our discussion! Read on to learn more about Dr. Kay Segler and the future of BMW M cars. BMWBLOG: Can you tell us about your experience so far leading BMW M? Dr. Kay Segler: Each and every day is thrilling. I joined on the 7th of May last year and I would have missed every day had I not been here. Thrilling was especially the fast that, with the team, we could develop the M3 GTS in a very fast time. At the beginning it had no name and then we only found the name later. The other car, which will be revealed a little bit later this year, lets see when, is the BMW 1M coupe. We have other products in the making now, the new M5 is in development which will come in the next year, towards the end of the year. It’s fun to do one of these cars. In addition we are not only responsible for the M cars, but also for the M sport packs, the options, as well as BMW Individual and the Driver Training program. There is a lot of development in these business fields too. BMWBLOG: What is your vision for future BMW M cars? Dr. Kay Segler: There are certain requirements that need to be taken care of like reduction of Carbon Dioxide emissions. Then the clear task is to offer “two cars in one” for our customers. A day-to-day car to drive, then with the push of the M button you have a race car. Like in the new X6M and X5M, and you will see in the new M5 that you have two cars in one. What is very clear is that, as we have been in the past, we want to be the youngest performance brand. Therefore we need this new car that will come out in spring next year. We want to be young. Young people and kids should be attracted to this brand. BMWBLOG: What is your favorite BMW of all time? Dr. Kay Segler: There are so many answers to that question. For instance I’m also a motorbike rider, I like the GS all through the years. You cannot compete with a motorbike against an M car like the E30 M3. So, there are a lot of dream cars which I like. I like very much the car which I drive currently, the X6M in red. It’s a fantastic car and I’ve already done 15,000 Km on it, it’s a tremendous car. BMWBLOG: So maybe to narrow it down, what is your favorite M car of all time? Dr. Kay Segler: At the moment, the M3 GTS. BMWBLOG: What design principles are core to the M brand? Dr. Kay Segler: One thing is always important, that the function is governing a lot of M design. For example, the size of the air intake – and you see it on the X6M for instance – you cannot make it smaller. That car swallows a lot of air, and also the aerodynamics are governing a lot of design and we will not compromise at all. On the M3 GTS we needed that spoiler to give additional road holding. I would say we have the strength in BMW design where we already have a very strong base to work from, then we add this functionality into it and make it into an M car. BMWBLOG: How will BMW M differentiate their turbo charged engines from those of other turbo sports cars? Dr. Kay Segler: That’s a good question, but we are not here to differentiate ourselves from competitors but to fulfill the dreams of our customers, full stop. I think what we proved with the last car we did, our turbo S63 engine in the XM vehicles – the responsiveness in these turbo engines is second to none, I mean, this is unbelievable. BMWBLOG: This is doubling back a bit on the last question – what sets M cars apart from the competition, how would you separate M cars among other sports cars? Dr. Kay Segler: I would look at the fact that we are not here to fight against the competition, but we are here to be number one. We don’t look back to anybody else. The “two cars in one” approach is something we are doing perfectly and I think that will be an important feature in the future. There is a tendency that, sure you can make pure sports cars, but what is the value when you have these pure sports cars in the garage and only every third weekend you take it out? What’s the use of that? We don’t want our cars sitting in garages, we want to have cars which are driven. BMWBLOG: Describe the ideal “M driver” – who are they; what are they like? Describe their personality. Dr. Kay Segler: An M driver has a lot of emotion for cars. They have a lot of emotion for driving and going to his or her personal limits. They are eager to use a car on the racetrack. They are excited for the car, but also for the personality, because car and driver are one – not two. There is one personality out of it. Then that customer is talking to his friends, telling them that his car is the best car in the world. This is a perfect customer for us. BMWBLOG: All M cars are at home on the racetrack but some are better suited than others, weight being a key factor. Are we going to see more enthusiast oriented M cars such as the 1M Coupe? Dr. Kay Segler: Yes, we cannot talk about the future but you already can see that we have some very thrilling ideas, but people have to wait. BMWBLOG: I’m trying not to pry but it’s tough! Can you tell us about a few design highlights of the 1M Coupe? Any details are welcome! Dr. Kay Segler: The one thing I can tell you is that we will reveal a colour, and similar to the GTS colour, it will not be forgotten. People in some years will recognize it. That’s one detail. BMWBLOG: How do you make an M car more affordable to the masses without losing the brand’s cache and prestige? Dr. Kay Segler: When a young customer with a little less money wants to enter the M brand they buy a used M, and all of the M cars are still around. So it’s a question of, do you buy a used M to enter the brand? Is this diluting the brand? No.So it might be an alternative to a young driver, either he goes for a used E46 M3 or he goes for this new M coupe. This is not diluting the brand. BMWBLOG: When it comes to driving dynamics, how do current M cars compare to their predecessors of decades past? Dr. Kay Segler: One strength is that we have a lot of electronics on the car which gives the driver additional safety backup and very fast reaction times which in the first cars you couldn’t have. Therefore I think that electronics are one of the very strong developments which we have and we will continuously have in the next years. It gives you better feedback and in certain very critical situations it gives you a back up system. BMWBLOG: Our readers long for the raw, pure, unadulterated road feel of early M cars like the E30 where you are so connected to the road and you feel every pebble through the steering wheel. It’s almost on the rough side – but it gives you that passion and emotion from the car. Will we see future M cars getting a little more to that raw side? Dr. Kay Segler: The other car which has a similar approach is the M1, you’re correct. Most probably [future cars will not be] as pure as this so I would advise, just go for buying one of these cars. You cannot repeat these cars, for a lot of reasons – a lot of legislation would not allow that design. Therefore it’s unique and it’s worthwhile to buy an E30 M.
BMWBLOG: As a bespoke automotive company, are M cars manufactured differently from generic BMW cars? For example, are portions of them still hand built? Are they prepared at a separate location? Dr. Kay Segler: We’ve integrated the production of the cars with the exception of the M3 GTS for instance. We’ve done this because it saves some costs and it doesn’t compromise any quality. In addition you don’t need to push any volume. Once you have a factory only for your cars and you run out of demand, then you must push volume and that destroys the value of the car. Therefore we’re very happy that we can integrate production into the factories and they are doing a tremendous job for us. Because demand is higher than expected, it’s also no problem for them to do it for us. BMWBLOG: So are there any engines still hand assembled? Is there an element of hands-on on any current M cars or is that a thing of the past? Dr. Kay Segler: Yes on the M3 GTS for instance, they are pre-prepared in the factory and then they hand them over to us to complete them in our factory. BMWBLOG: Does M influence or shape the initial design of BMW cars so as to suit M dynamics in the eventual M car? For example, in the design of the new 3 series, does M have any hand in shaping the fundamental layout of this new car so that down the road it will suit the properties of a performance M car? Dr. Kay Segler:Not really – the basic shape of a 3 series or 5 series is independently developed but all the BMW cars in themselves have a sportiness built in. So you don’t need to use spoilers to make it sporty. It’s already in the genes of each and every BMW car, therefore it’s quite easy to built on that solid basis. BMWBLOG: How long is the design process to produce an M car? Dr. Kay Segler: It depends. We don’t compromise therefore we come later than the base model as you see with the new M5, because we don’t want to compromise. On the 1 series M coupe we were very, very fast – I mean tremendously fast! We took some risks but we managed it because we are a very small team, there is no hierarchy. Basically the principle idea was in June/July of last year that we might do something like this and we will bring it out next spring. So great job by the team. BMWBLOG: The limited edition M3 GTS is a major success, selling out before its production run ends. Will we see similar “weaponized” track-ready M cars across the line? Dr. Kay Segler: “Weaponized,” I like that. That’s a good one. First of all, secrets are only secrets when they are kept. In general there is a potential for very specific editions, as long as customers want to have something they will get it. We don’t have a very concrete project running at the moment but we have appetite for such a thing. BMWBLOG: Could you describe M in one word? BMWBLOG: Who do you see as M’s closest competition? BMWBLOG: As environmental issues evolve and emissions and fuel consumption become of greater concern, new Powertrain technologies are being sought. Will M embrace alternative Powertrain technologies such as diesel or hybrid power? Dr. Kay Segler: We’ve already announced than in the new M5 we will reduce consumption by 20 to 25 percent. By that we are a very clear leader among our competition. Other technologies are simply judged by whether they suit our targets or not. When you add too much weight, for example with a hybrid you also add too much weight to the car which reduced handling. The diesel question is a very interesting one. As long as our main market in the United States has a problem understanding the potential of diesel, that limits the potential of doing anything in the field. Diesel engines are tremendous engines but the US is our biggest market. Diesels have race engine potential, we’ve won 24-hour endurance races with our diesels for many years on the Nurburgring. Help us educate other markets about the potential of diesel! BMWBLOG: As huge diesel fans at BMWBLOG, we will try our best. Thank you for sitting down with us, we eagerly await future M products! Previous post BMWBLOG Exclusive Photos: 1M Coupe Underbody Exposed!